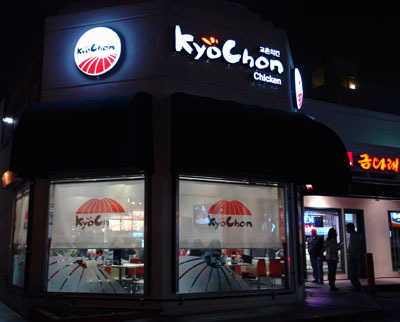 Kyochon Chicken is located in the heart of Koreatown. As you can expect from a fast food, there is no real decor and the comfort is minimum. Additionally, parking in the area may be difficult. Service was very good for a fast food: we were served quickly at our table. 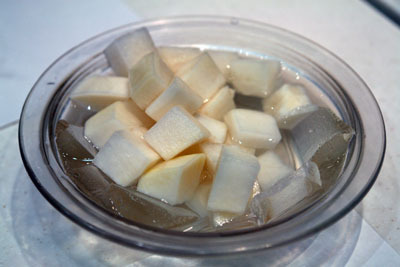 First, we were served radishes in cold water. It’s a nice attention that kept us busy while we were waiting for our diner and later helped to alleviate the amount of chili use on the chicken. We started sharing a chicken and rice cake combo. The broiled chicken was served with long round rice cakes, peppers, onions and carrots. All of that in a tomato chili sauce, topped with sesame seeds. It was very tasty but very hot. After the chicken and rice cake combo, we shared a hot combo. The combo comprised chicken wings and drumstick, served with cabbage. The cabbage was topped with mayonnaise and ketchup sauces. It was really good but really really hot. Finishing the dish, my lips were burning while my tongue was hurting. 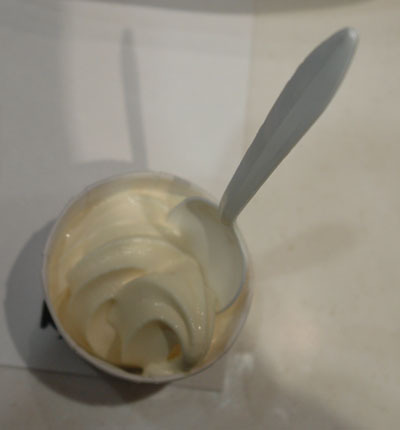 At the end of the meal, we were served vanilla ice cream. It’s another really nice attention that really help me to recover after eating food that hot. Around $15, including drinks (orange juice and coffee) and tip. 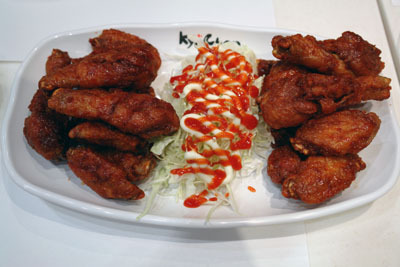 Considering the food and the service, Kyochon Chicken offers excellent value for money. I will definitely come back. Kyochan is by far the spiciest food I have had anywhere. And I’m not some whitebread and macaroni and cheese eater. 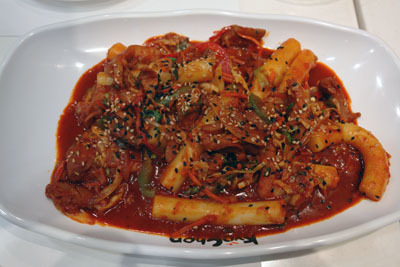 I eat kimchee for breakfast and have never found a curry that is too hot for me. But the spicy chicken and duk gogi at Kyochon almost had me at the ER for a skin graft. There is no point to eating food that is truly painful and I nearly gave up… but then the marvelous thing happened. As if blinded by pure white light my entire being became awash in glorious Korean chili! The pain turned to pleasure and I found that I couldn’t stop. This is not spice for flavor, this is spice for spirit quest, like when Homer ate the chilis grown by the inmates of a Guatemalan insane asylum. So GO! Go to Kyochon. Find your spirit guide. P.S. The kimchee I had the next day seemed about as spicy as a bowl of soggy Rice Krispies.